Last week, we were invited for lunch at Japanese friends of us. They asked us if we want to eat Sushi and Tempura, but we had to make the Sushi ourselves. Of course we wanted that, we love eating Sushi and tempura. But making it is quite another story. The last time I made Nigiri Sushi myself, all the rice was sticking to my fingers and the Sushi really looked awful. 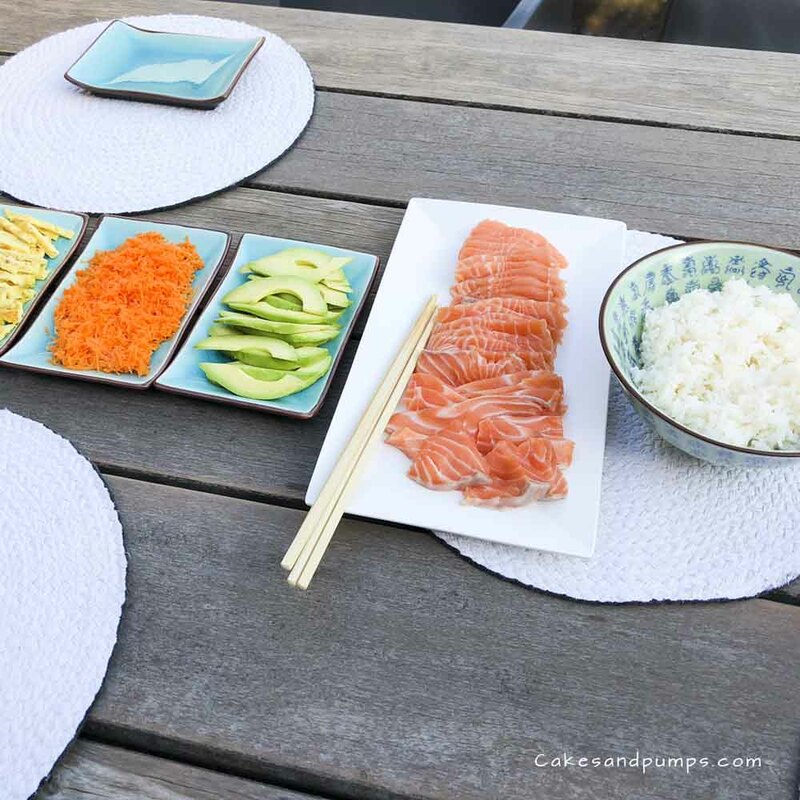 But when we arrived at our friends house it turned out that they had a very easy way of making Sushi, together sitting at the table. Even for us Dutchies it was simple, so we tried it this week already at home. 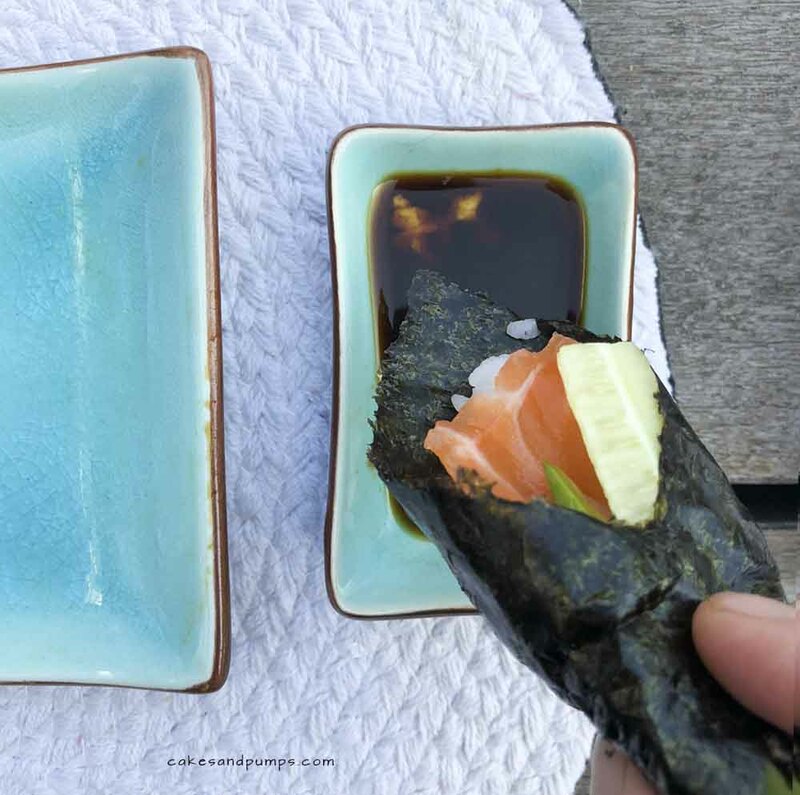 It’s super easy and everyone makes the Sushi to it’s own taste. 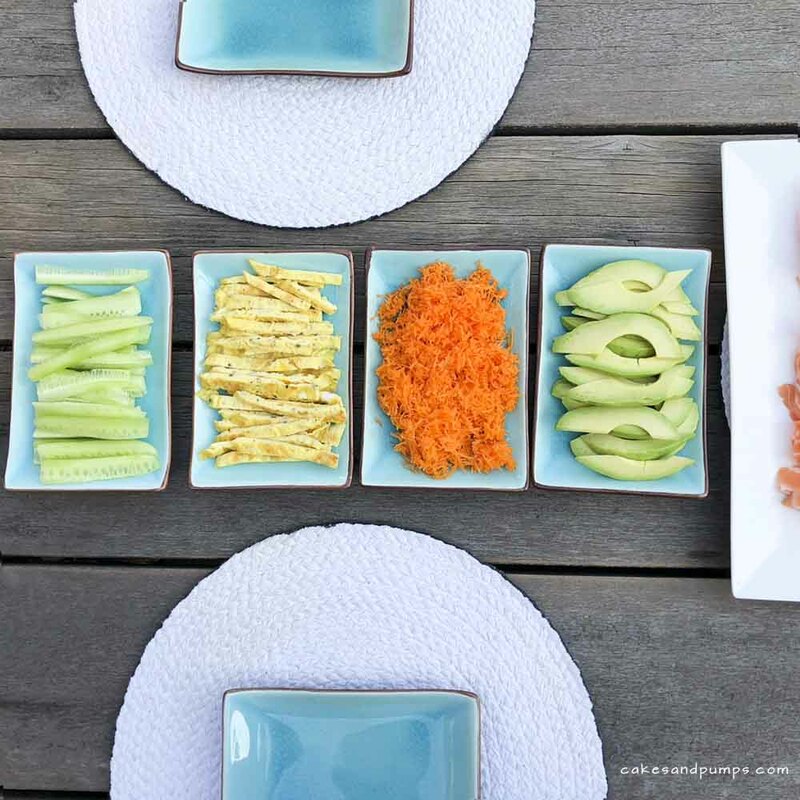 – As toppings we used raw salmon, cucumber, avocado and baked egg. Martin also made grated carrots, but at te end he didn’t eat this in the sushi. As toppings you can also use for example homemade tuna salad, cooked shrimps or surimi krab. 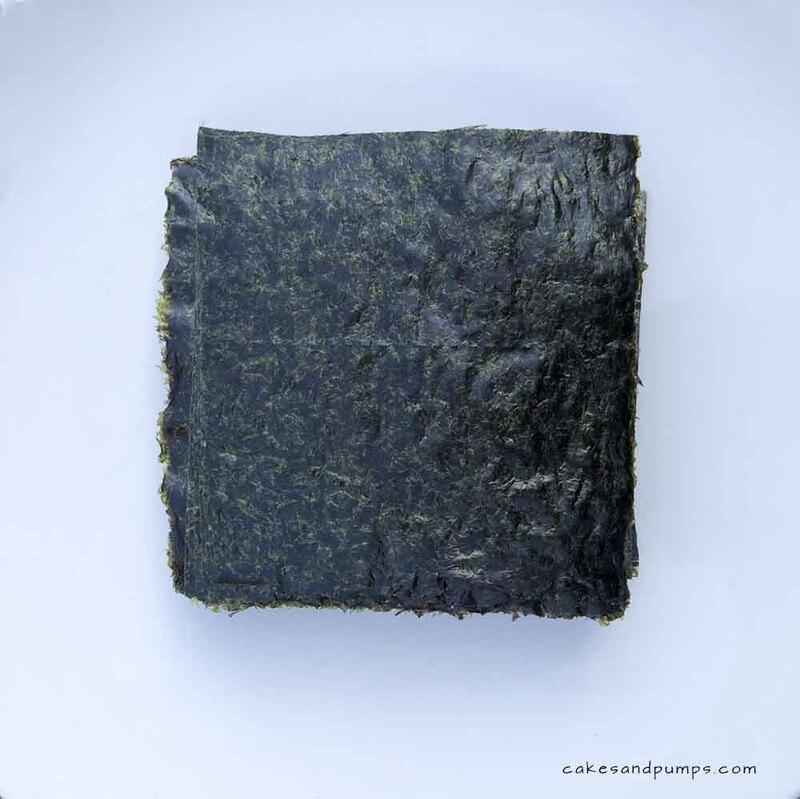 The nori sheets are in a bigger package, you take them out of this package and cut it in four pieces. I cut the whole bunch at once, that’s easy with some good scissors. For the rice we bought Japanese rice at the Asian store (Toko). How much you want to make is up to yourself, are you a big eater or not. We cooked two bowls of rice and almost finished it all, but we are good eaters (hihi we usually eat too much with Sushi). 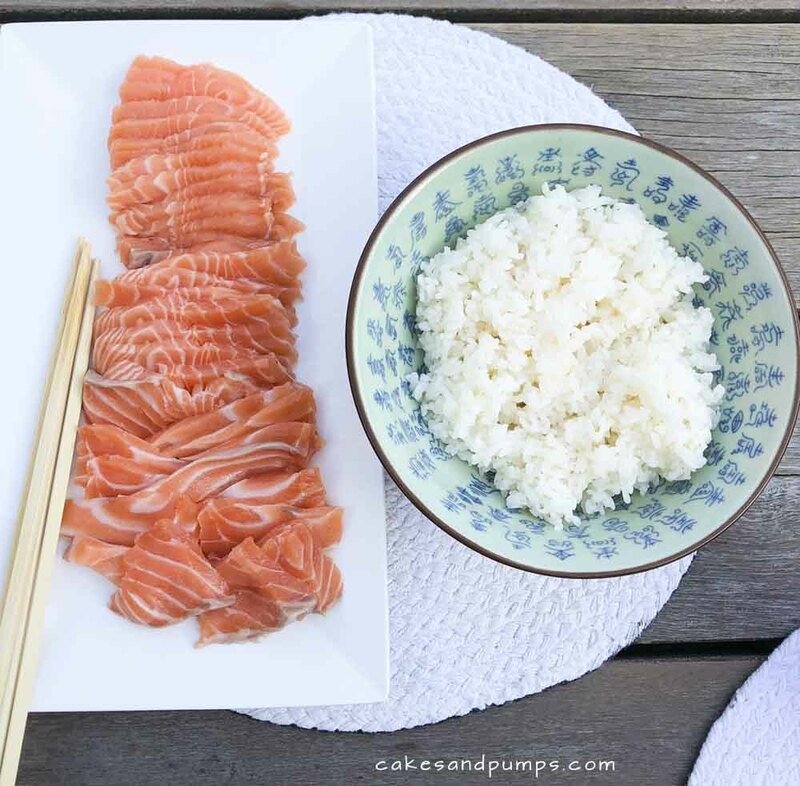 You need to cook the rice first and then you prepare the rice like normal Sushi rice. Most of the time I’m just doing whatever I think is right with cooking. I’m not the schedule type. I cook the rice in a ricecooker. First I put the rice into the pan of the cooker. Then I wash the rice under cold water and carefully throw the water away. After that I add new water as much as the water is a finger pad higher than the rice. I you want some more rules than that, take 500 gram rice, wash it the same way I did and put 750 ml of water in it after washing. Let the rice and the mix cool down further to room temperature. If you don’t have a lot of time, put it some time in the fridge. You first need to Beat the eggs in a bowl. We made the egg in a western way with salt and pepper. Then you bake the egg, preferable in a Japanese style Tamago pan for Japanese eggs. If the egg is ready, get it out of the pan and cut it in small stripes with a length of 5 cm and wide 0.5 – 1 cm. Cut the cucumber also in slices of 5 cm and 1 cm wide. 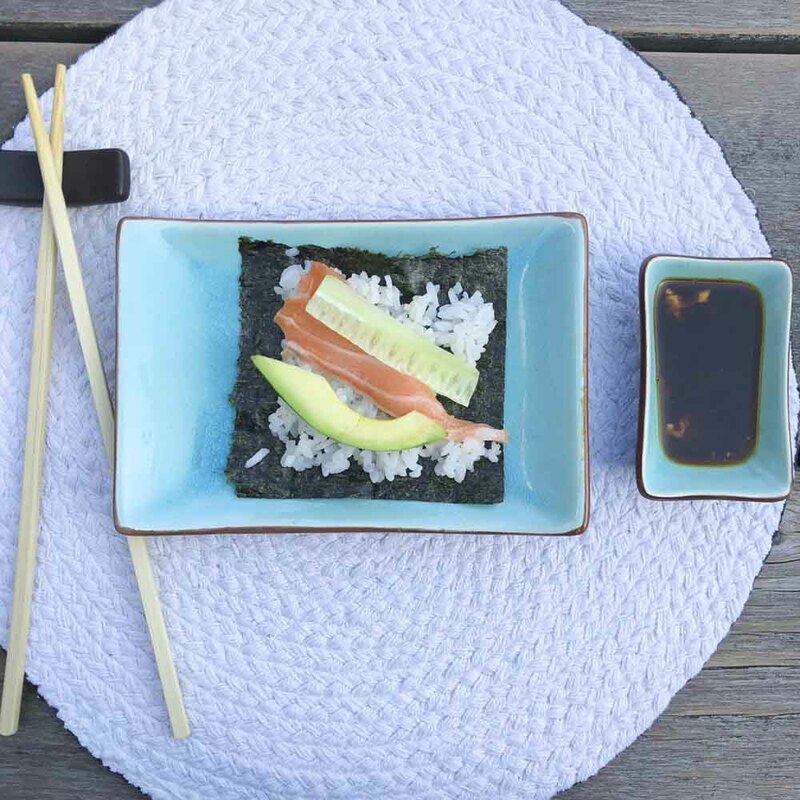 You can cut the salmon in thin slices of 5 cm. Cut the avocado in two pieces until you reach the pit. Remove the pit and cut the avocado with a spoon out of the peel. You can now cut the avocado into small slices. Put all the ingredients seperately on plates or group them all together on a big plate. Put the rice into a bowl. You can put some sesame over it for garnish. We didn’t do that, because our little man doesn’t eat the white rice anymore then. Now everything is set to go to the table. Give every guest a little bowl and some soy sauce with maybe a little drop op wasabi paste for everyone’s own taste. How do you make the Sushi? 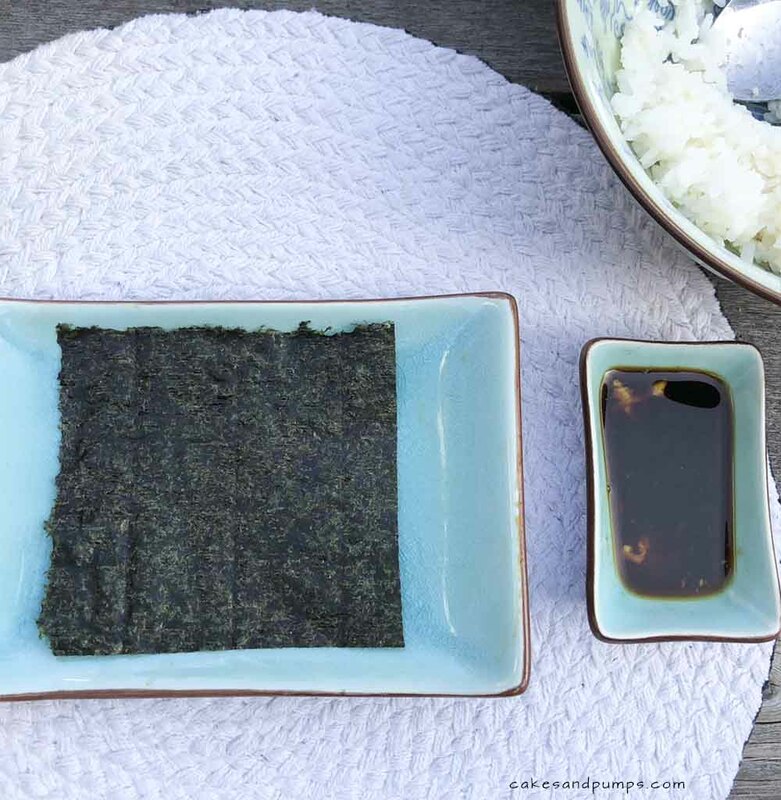 You start with a nori sheet on your plate, where you put some white rice on. 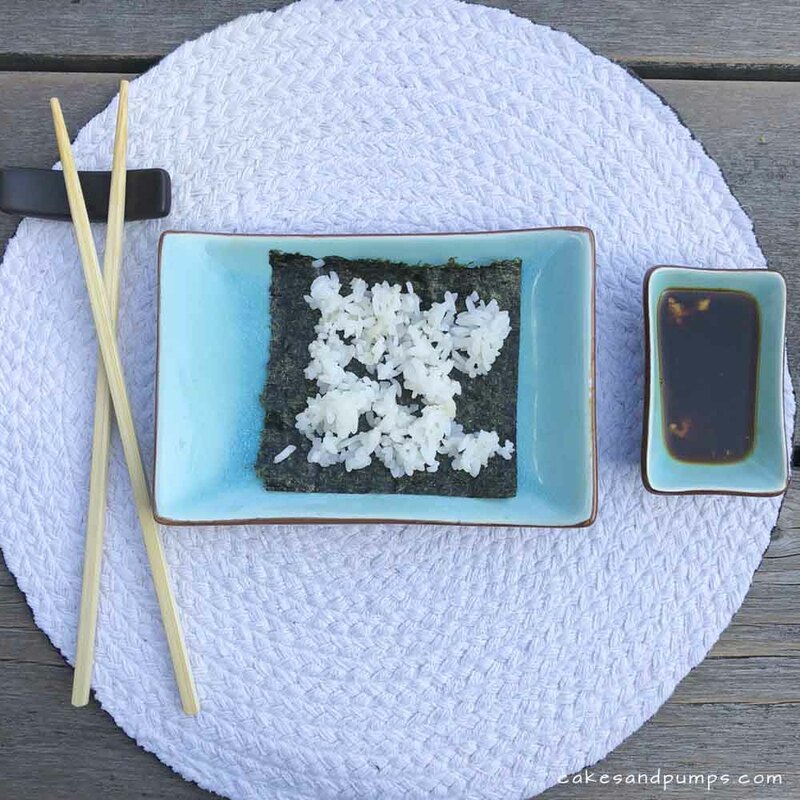 You divide the white rice over the nori sheet. Then you put some pieces of the filling in a diagonal way on the rice. Then you take two pieces of the nori sheet and you fold them to each other and tadaa, your Sushi is ready. Put your Sushi in the soy sauce and take a bite. Do you like it? Once and a while some stuff will fall out, but that’s ok. The nicest thing of making this kind of Sushi is that you can sit at the table with your friends, while everyone makes it’s own Sushi. 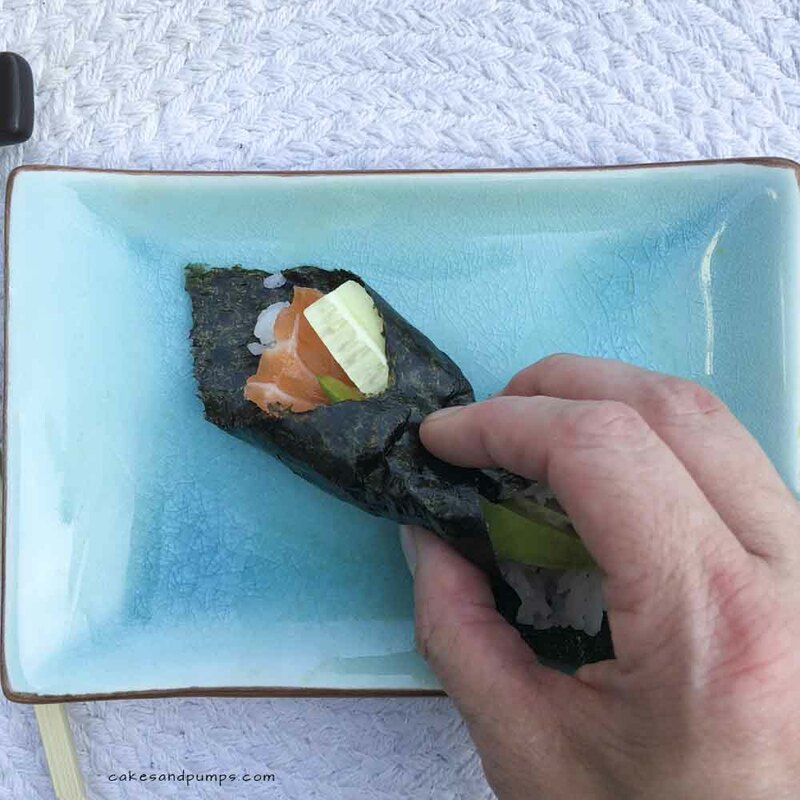 And where normally Sushi making is quite difficult, this Sushi making is so easy that I think everyone can do it. Naoko and Masa, the lunch was delicious and thank you very much for this great idea. We will definitely make this Sushi a lot more.